This crazy little transformation into Freddie Mercury is easier said than done. It's no secret that excitement and anticipation is building for the release of Bohemian Rhapsody. The big-screen movie will chronicle the years leading up to Queen's legendary appearance at the Live Aid concert back in 1985. Before moviegoers experience director Bryan Singer's latest movie, E! News had the chance to sit down with the cast where they revealed all the work that went into becoming true rock stars. "I was very cognizant of the work it was going to take to get anywhere close to becoming Freddy Mercury. 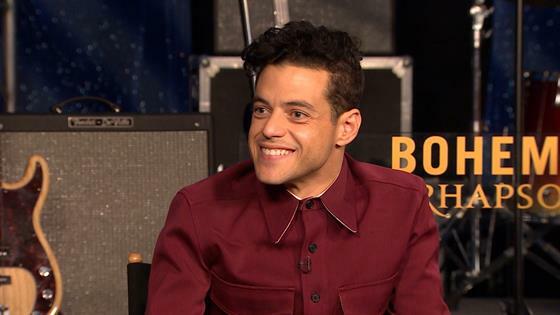 I flew myself to London and put myself up and just got hammering away," Rami Malek explained to E! News exclusively from the Park MGM Hotel in Las Vegas. "Piano lessons and worked with a movement coach and singing lessons—everything I could possibly do. And then I watched copious amounts of Freddie Mercury performances." He continued, "I just went to YouTube. Thank God for that now. It's just something I drew from every night and just sat there and tried to replicate it." While being on stage was one thing, replicating Queen's signature look was another project as well. Thanks to incredible costume designers, hair stylists and makeup artists, the cast was able to experience more than a few looks that caught them by surprise. "We had an amazing costume designer and a great hair and makeup designer and everyday was different," Gwilym Lee shared with us. "It was something to look forward to everyday to see how outrageous, flamboyant and over the top we looked." Joseph Mazzello added, "They gave me a perm on day one. We had like six different wigs. We had looks through like 16 years." As for the moment when Rami put on that mustache and was in full costume, let's just say everyone was blown away. "I've known Rami for 11 years…so when he put on that mustache and the teeth and all of it, it was truly wild," Joseph teased. "I got goose bumps because he just embodied him so perfectly. It was a crazy thing to know someone so well and just be who are you?" While moviegoers will have to wait until November 2 to see the finished project, the film's trailer has already led to plenty of excitement. Even with all the buzz, however, the cast just hopes to make Freddie and his family proud. "I think he would genuinely just hope that people enjoyed it, that they loved the music, that he felt like we captured these characters and his essence well enough and close enough," Rami shared with E! News. "And he'd probably just want to go have a pint afterwards."